We haven’t even carved our pumpkins yet and today is Halloween! It’s okay. Instead of carving our pumpkins last night, we went to the store and bought some glow sticks to hand out to the trick-or-treaters instead. Halloween has so many opportunities to share Jesus with those around us. If anything, it should be one of the most important holidays that we get to shine His light in the dark corners of our world. Each day is an opportunity to share God’s love and light, even on Halloween. Shining God’s light can be as simple as lighting a bonfire and inviting your neighbors over for some hot cider. You can run into Dollar Tree to grab some glow sticks and silly string for a last-minute Shine His Light party. It doesn’t have to be anything fancy. Again, thank goodness for Dollar Tree! Most of all, I want it to be super fun. I especially need it to be fun for me if I’m the one putting this together, right?! Opening up our bibles doesn’t have to be so boring or rigid. I want my kids to be attracted to His light and not drawn to the darkness. We have a great reason to go a little crazy with some skeletons, toilet paper, and silly string tonight! If you don’t have time to put anything together, here are a few super easy Halloween devotions and activities that you can do with your family and friends that are simple and fun! Read John 11:1-44. If it’s too long for little listeners, summarize the story for them or watch the video clip below. Try any of these Minute To Win It style with family and friends to see who can finish under 60 seconds! Solve a Lazarus word search. Watch the Raising Lazarus cartoon clip via YouTube. View the entire episode here. 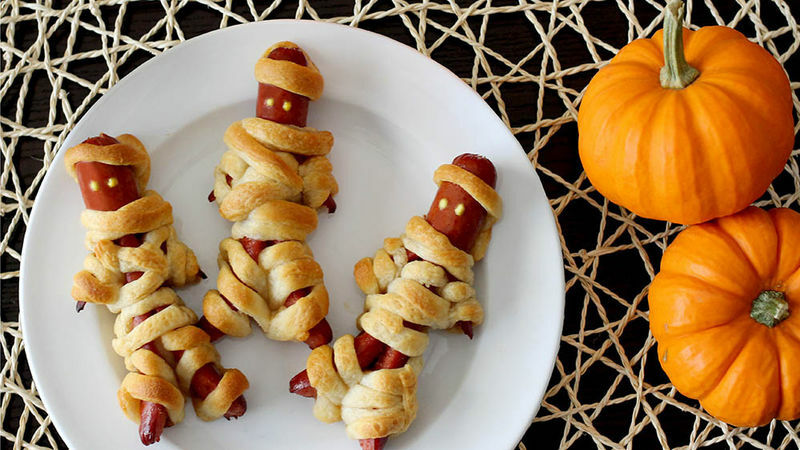 Create these cute Walking Mummy Dog treats. Enjoy them as you read, listen, or participate in your devotion activities. 5. Play the Toilet Paper Mummy Race. If you enjoy Minute To Win It type of fun, you have to find a roll of toilet paper and try this. Everyone can play! 6. Decorate a mummy pumpkin. These look so easy. I can do this! There’s no carving and you can even substitute tape if you wanted to leave out the gluing. My two-year old can do this! Read about the dry bones in Ezekiel 37:1-14. Talk about what God’s vision meant. Solve the Dry Bones word search. This could be another Minute To Win It game. Play a game of Operation. It’s a classic! Print this skeletal system worksheet for each member of your family and see who can label all of the parts in under a minute. This might be suitable for older kids. 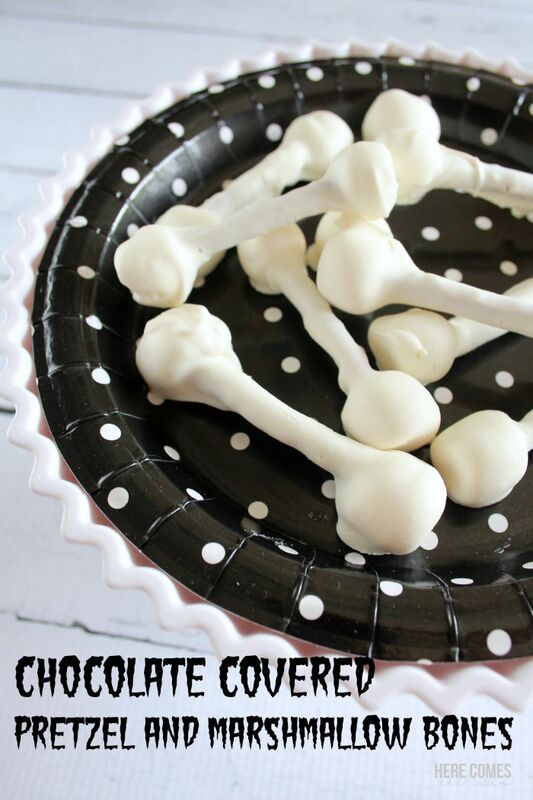 Create these yummy chocolate covered pretzel bones. We didn’t even get to the chocolate part! My kids just had fun building with marshmallows and toothpicks. Pray! Pray with your kids and allow God to use your hands and feet to extend His reach into the community around you. 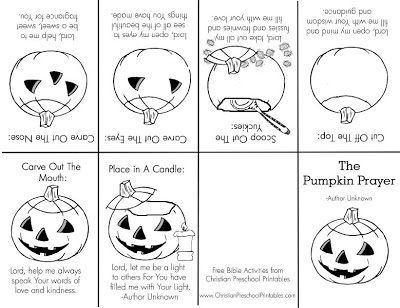 Have you ever heard of the Pumpkin Patch Parable or read the Pumpkin Prayer as you carved pumpkins? We quickly did it during our Sunday School class and let the kids take home these printables. I keep telling myself that l can participate in these activities even after Halloween is over. Shining God’s light while trick-or-treating isn’t the only day we have to celebrate this Good News. Halloween is yet another opportunity to impact our kids for Christ in fun and engaging ways that will make Christ’s message more attractive and vibrant than it already is. How are you shining His light this Halloween?